It was Alexis big day yesterday. She is now 4.5 years old and passed the evaluation to move up to the next level in gymnastics school, which means her hard work and all those practices at home (she did it all by herself with anyone asked her to, what a self-motivated little one) had paid off. She was so proud of herself and so did mommy. She improved a lot within the last 2 weeks, even I was impressed. To celebrate her little milestone and show my support for her hard-working, I arranged a movie date with the girls (we watched Rapunzel), served them these girly and pretty pink kettle popcorn for snacks. Everyone had a good time and they said it was the best day ever. 1. In a large pot, add vegetable oil and 1 kernel over medium high heat, cover the lid. 2. Wait until the kernel popped, add all kernels, sugar and food color gel, stir well and cover with lid. 4. Turn the heat off and let it cover for 30 seconds. 5. Sprinkle salt on popcorn, close lid and shake the pot up and down to mix. 6. Open lid and let sit for 3-5 minutes before serving, enjoy. 1. Beware of the hot steam when you open the lid right after the popcorn popped, use a spoon to scoop them out. 3. You can change the food color gel into any color, liquid food color can be used too. 4. Serve this with your favorite movie and drink, most important part, share it with your favorite people, it makes the popcorn taste so much sweeter without extra sugar. 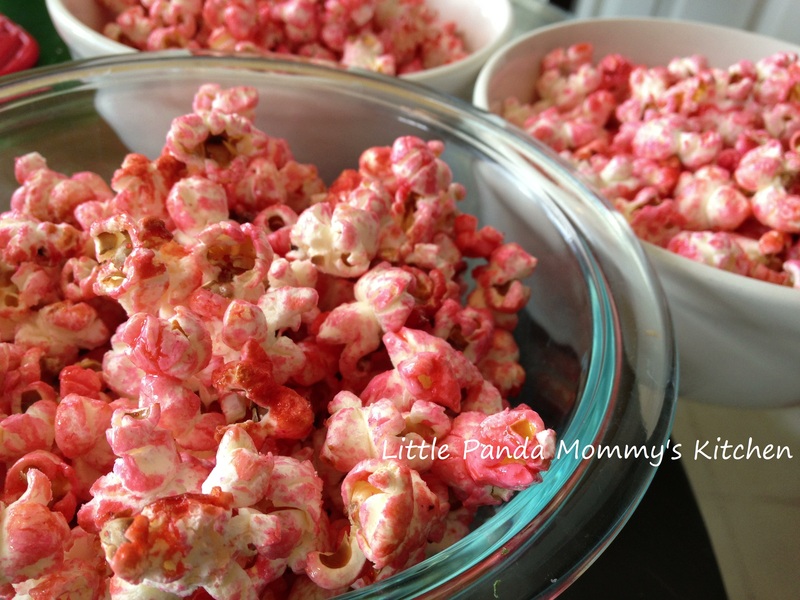 This entry was posted in cook in 15 minutes 15分鐘開餐, Easy Cooking, Snack Recipes and tagged Cook in 15 minutes, Easy Cooking, homemade pink kettle popcorn, Snack Recipes on August 22, 2013 by littlepandamommy.